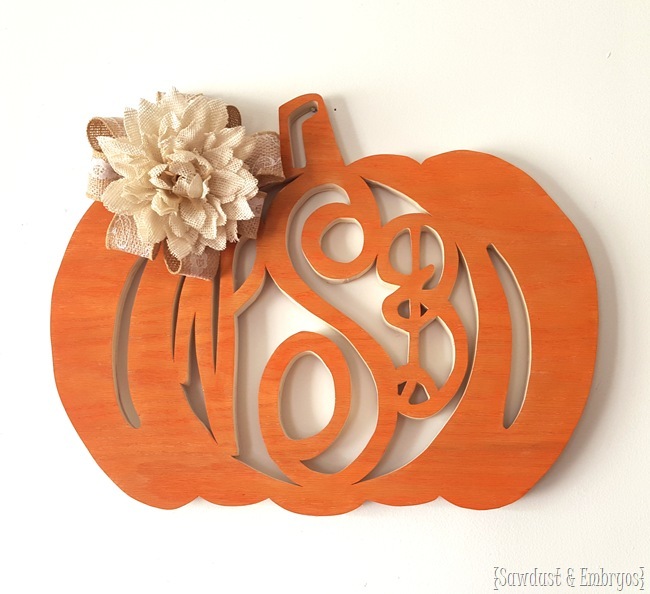 I’ve been seeing these monogram wreath’s all over the place, and thought it would be fun to make a couple fall themed ones just to see how they turn out! Because we have those doors that have a grid of paned glass on the top half. It would just look weird with a wreath. But the beauty of these wooden ‘wreaths’ is that they can be displayed indoors as part of your seasonal décor too! 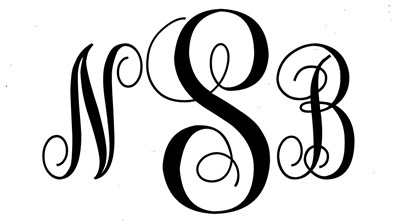 The first step is to create a monogram that is customized to your own family! Here is a really simple tutorial for how to create your file in Microsoft Word. There are also lots of tutorials out there for creating monograms in Adobe Photoshop or Illustrator, so feel free to google around for the best option for you! 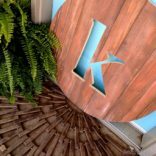 The image of our initials above is Monogram KK font and is free to download! I actually ended up using a different font for this project, but I can’t find the exact font for the life of me, so you’ll just have to pretend. 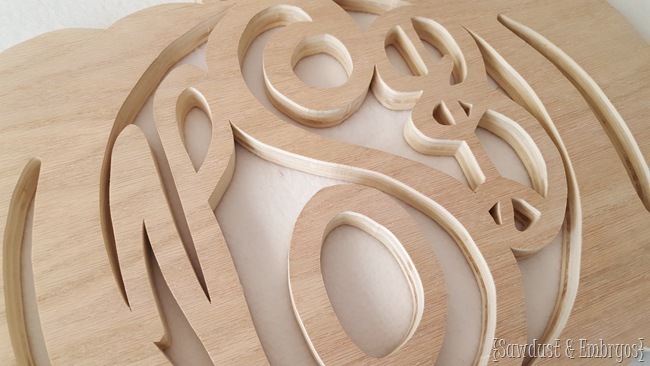 There are lots of pretty monogram fonts out there, so pick one that you love and roll with it! I decided to make one of each of these! 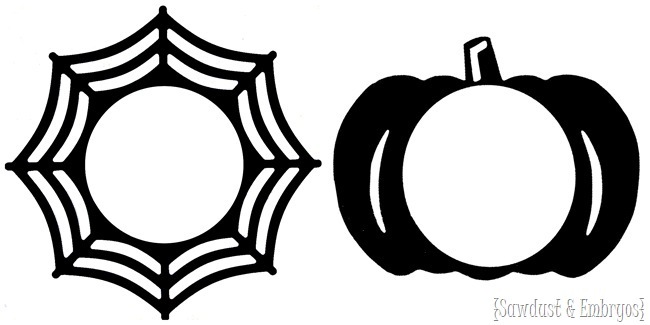 Right click and save the image below, and print the one you want to use onto a transparency, along with your monogram! 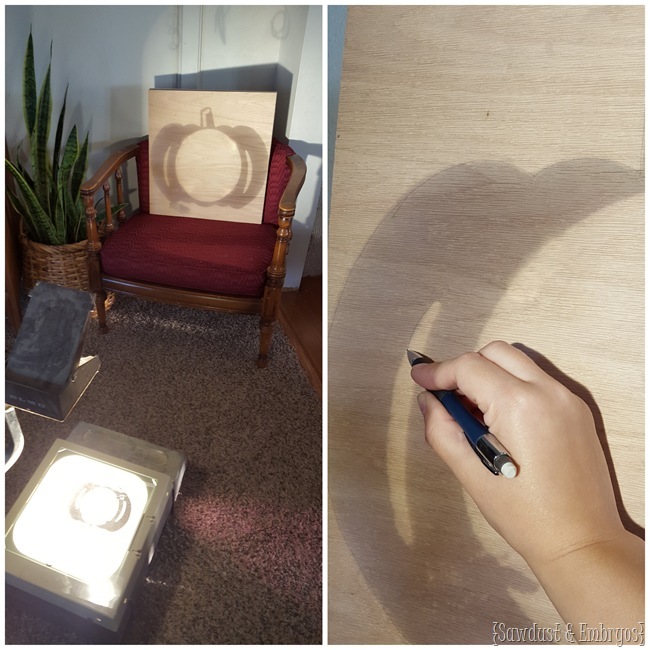 Then project your image onto a board with an overhead projector, and trace with a pencil. 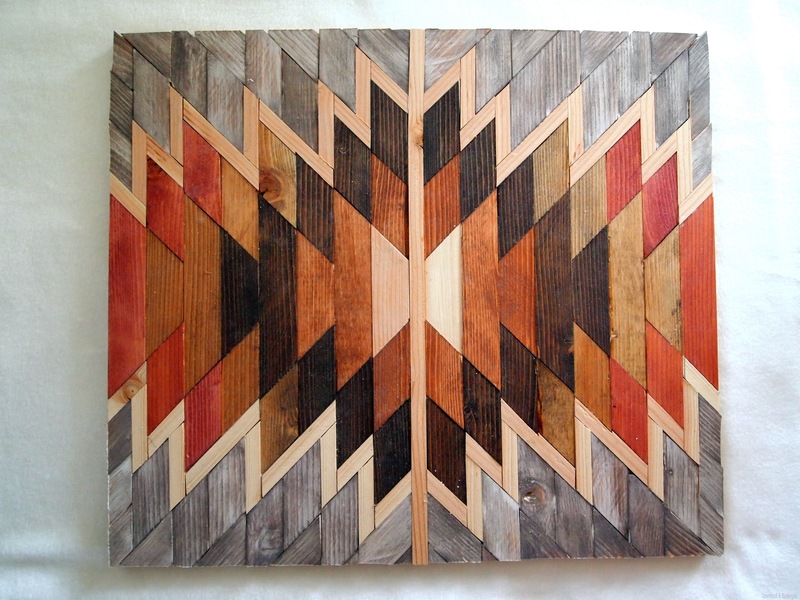 For this project, I used 1/2” plywood (18”square). Make sure than when you come back in to trace the letters in, you have them all overlapping. I traced the middle letter on first… making sure it was centered. And then moved the transparency slightly so each of the outside initials would fit and overlap appropriately. Notice how I put little scribbles where the overlap-age was happening? This was to remind me not to cut there! Then I put X’s on the parts that would need to be cut out, and drilled holes there to feed my blade through. 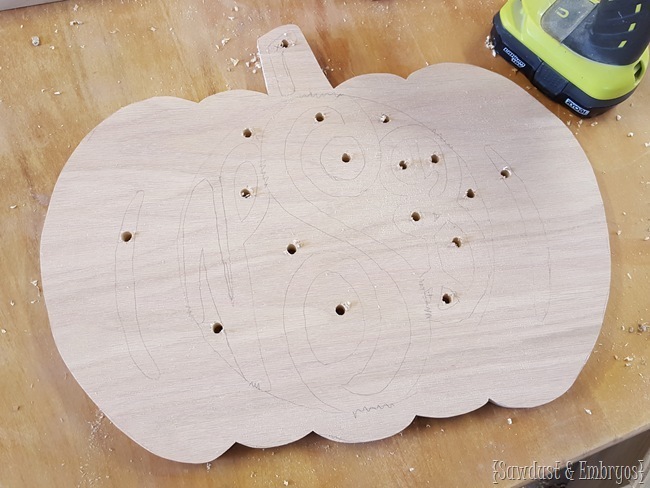 I couldn’t decide between using a jigsaw for this, or my scroll saw… and in the end went with the tried and true scroll saw (This is the scroll saw I use and it’s A.M.A.Z.I.N.G. But if you’re looking for a more mid-range (read: less expensive) then this one is also great quality and handles well! 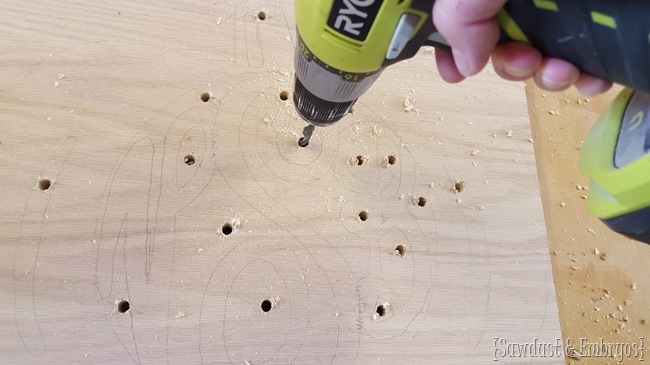 Whatever you do, don’t buy a scroll saw in the $100-$200 range. You’ll regret it for sure.). I just feel more comfortable and precise with a scroll saw. But if you rock the jig, you could totally go that direction too. Then scrolled out each individual section. 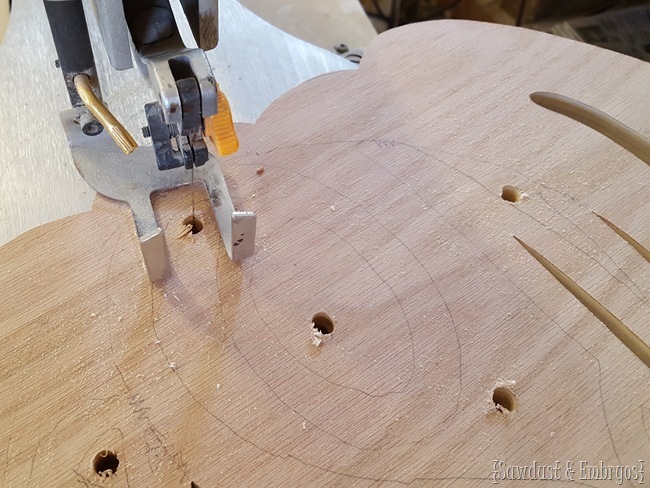 This might seem tedious to you, but you get in a groove… and it’s FUN! Each piece that comes out reveals the design more and more! This probably took me about 2 hours from start to finish… but dare I say it was a relaxing 2 hours! Just me and that gentle hum of the scroll saw. And the giggle of the twins using a 2×4 as a balance beam nearby. I sanded a little with 220 grit just to knock down any rough edges and sand off any residual pencil lines. And would you look at that detail? I just love! To finish things off, I wiped on a little bright orange water-based stain (Unicorn Spit) with a cotton cloth. I think one of these would look beautiful set in front of a wheat or corn husk wreath on a front door… but I like how it looks on the wall in my house too. 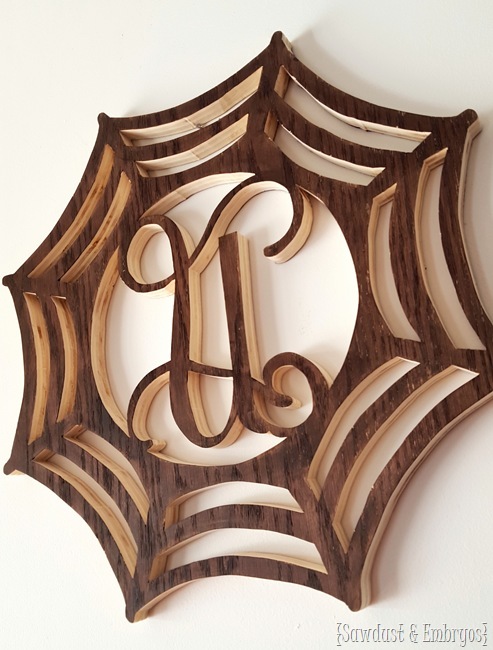 You know I had to make a spider web version too! I went with a single ‘U’ initial for my friend Brooke’s family. She was the first person that came to mind when I was trying to think of a Halloween fanatic. 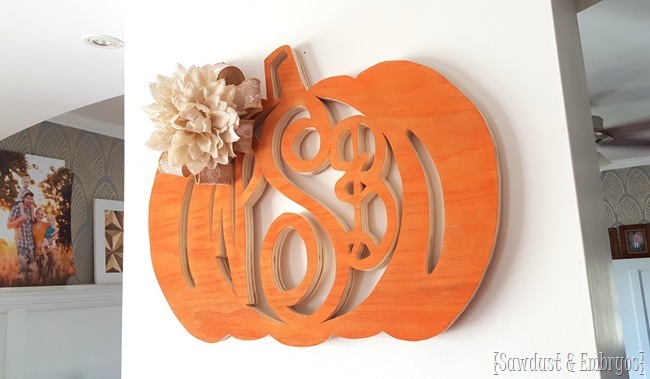 Have you seen how many pumpkins they carve each year over at All Things Thrifty?! It’s cray! 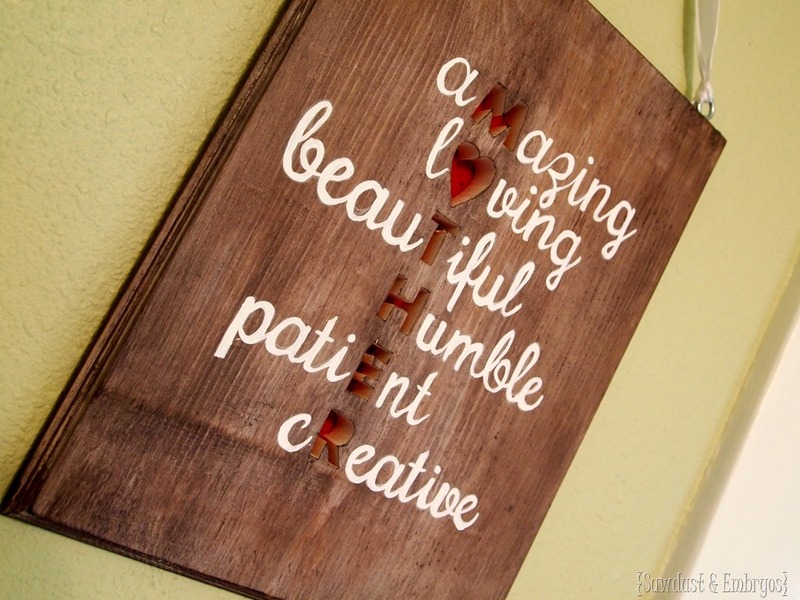 And she was awesome enough to show me a picture of it on her front door! SO AMAZING! I love throwing together little impulsive ideas like this, and having an awesome thing to show for it! And monograms are fun and timeless… it’s impossible to go wrong! Our family ‘monogram initials’ are decent (NSB), but my actual initials are a little inapprope… BS! And my first and middle name initials? BJ! Poor me. Do you have initials that are an unfortunate acronym or spell something silly? Come on, there has to be an ‘LOL’ out there somewhere! 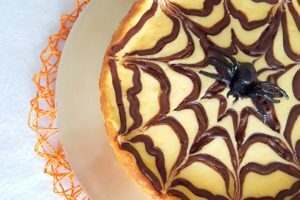 If you’re a lover of Halloween, you’ll love this Chocolate Swirl Spiderweb Cheesecake! PS! 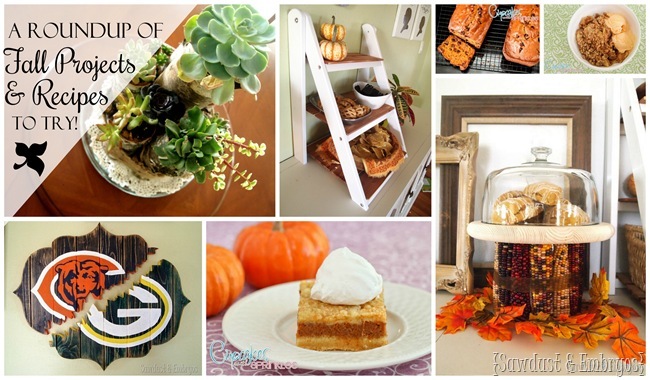 Be sure to check out these other fall-themed projects and recipes from our archives! Bu projeyi kesinlikleye deneyeceğim. Paylaşım için teşekkür ederim. 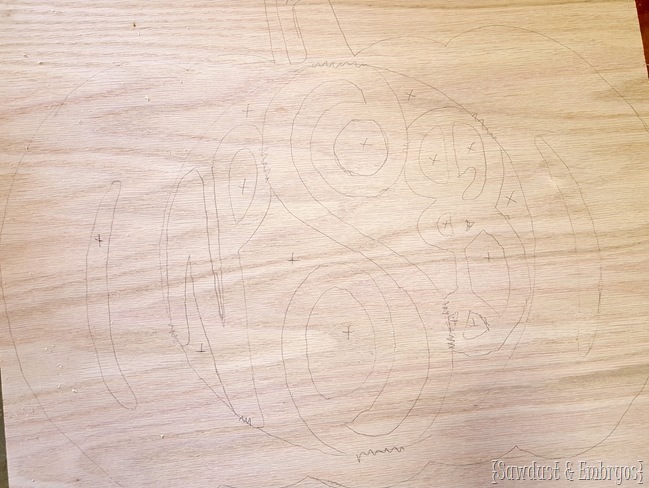 Hi there, I’m finally biting the bullet and i’m getting myself a scroll saw. Can you please share the teeth count of your replacement blades? I want to get a few extras all at once. You could hang it BESIDE the door instead of ON it.We hang the wreaths beside because of the wreath banging on the door when opening and closing. That’s something I’ve totally considered! I just need to figure out how to attach it to the siding. Did you drive a nail right into the siding of your house?? I buy siding hooks to hang decor on my house. They go in between 2 pieces of siding and snap in without damaging siding. HI Mary! Unfortunately our Etsy shop is still closed for the time being, so we’re not making anything to sell for now. So sorry! 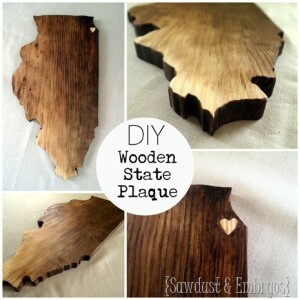 do you sell these in your Etsy shop? This is fantastic and I love your instructions – very easy to follow. 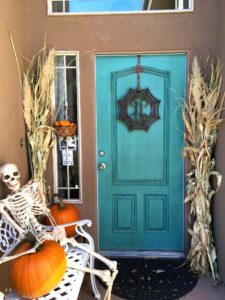 Thanks for sharing another awesome project! I WANTONE!!!!!! Like Now!!! They are both adorable! 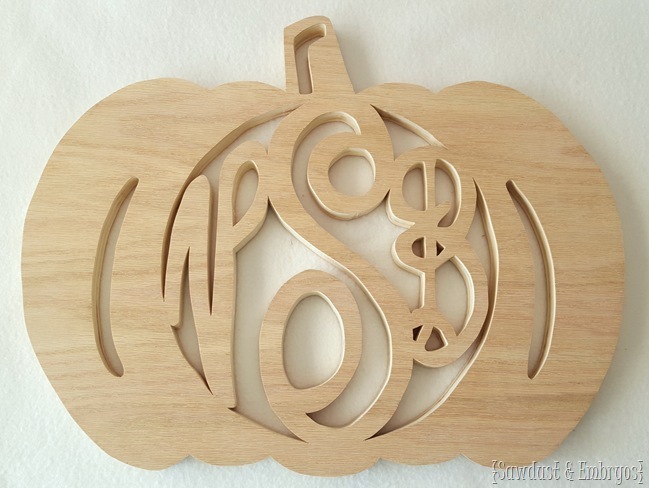 I have purchased a couple of these monograms from websites but none of them have the depth yours does. Love it! Looove these! I recently acquired a scroll saw, but I’ve been too chicken to use it! You make it sound easy. 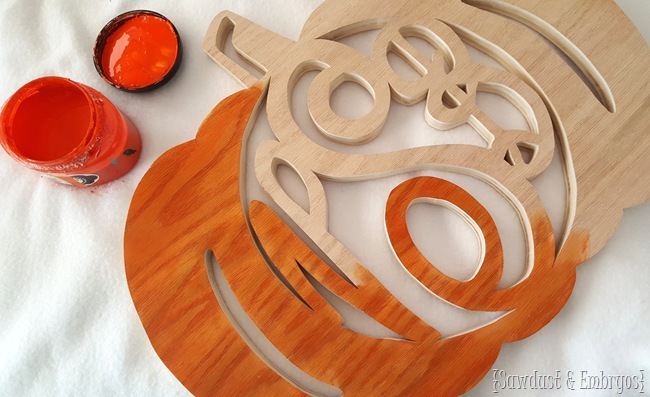 Do you have any scroll saw tutorials or videos? He looks good with a little floral embellishment, eh?! The U is so pretty isn’t it? That font is amazing… it makes every letter look good! Yeah, growing up my initials were BM and now they are BS so I’ve always been a little inappropriate. I have two middle names so if you use Beth instead of Elizabeth I was BALM and now I am BALS. Bethany this is gorgeous. Love the concept and your scroll work is beautiful. Thanks for sharing on FB BethAnn!